How an Orthodontist Can Help Me Sleep? A crooked bite is often associated with a crooked jaw. Upper and lower midlines do not line up, cross bites and scissors bites are common features with crooked bites. The crooked bite maybe caused by a real skeletal imbalance of the face with one side being longer or bigger but it may also be caused by a functional shift in the jaw due to teeth that are crooked or weirdly angled. This causes a premature contact on the crooked tooth when a patient bites down and they have no choice but to shift the jaw to a side so that all the teeth can touch. 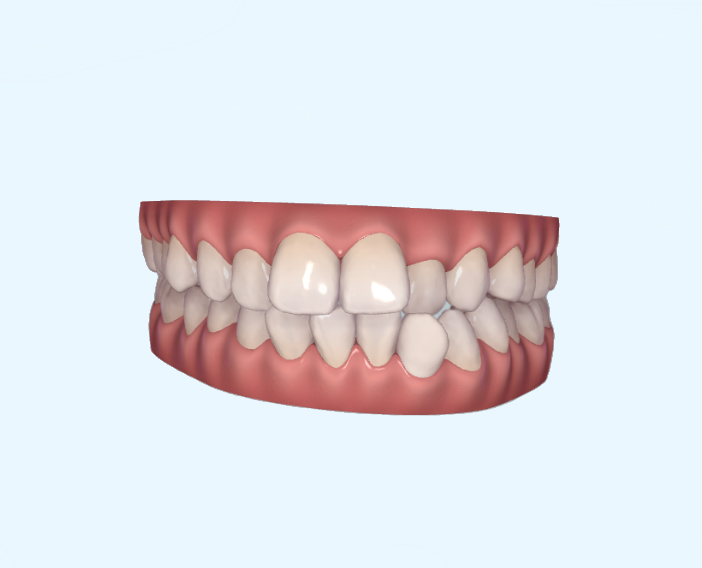 A growing child with a developing crooked bite should quickly be seen by our Specialist Orthodontist in order to apply Interceptive Orthodontics or Growth Modification to nip problems in the bud. This picture illustrates a crooked jaw/ crooked face or slanting face towards your right side. The right side of the face appears rounder and shorter compared to the slimmer and longer left side. Your chin may appear closer to your right ear. When the upper front incisors drop behind the lower teeth, they are in cross bite. Scissors bites describes a problem when the back teeth are displaced so far towards the cheek or tongue side that the biting surfaces miss each other completely. Just like how the cutting edges of a scissors shear past each other.